The Mabudachi boys from Furuba: Ayame, Shigure, and Hatori Sohma. I've had this idea for some time, after my individual Mabudachi wallpapers. I thought, hey, Shigure = green, Hatori = blue, and Ayame could = red, so together, Mabudachi = RGB (the primary colours of light). But it took some time for me to find the right picture to vector. This one immediately came to mind, except that Hatori is in the middle. it'd be RBG instead of RGB. I needed Shigure in the middle. 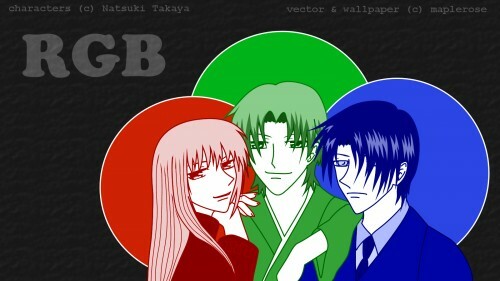 But pretty much all pics of them together have Hatori in the middle. So I ended up drawing my own pic, modelled after the reference pic. Anyway, I debated on whether just doing the outines or use actual colours. I decided the coloured version is bolder. Then it took some tries with background, but I ended up with simple black. Browse Fruits Basket Gallery: Recent | Popular. I love the way this came out, the trio are smexy! Hehe! Thanks so much for sharing my friend, you did wonderful! Wow, they look awesome here...a great trio!